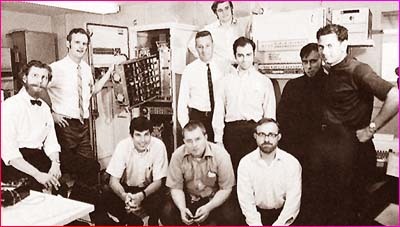 Creators of what became the Internet operated in the pre-PC era on massive computers. What started with a dozen or so researchers has grown to 30 million users. ou may associate the Internet with electronic mail and business applications  but it came into being with global thermonuclear war in mind. The Internet had its genesis more than a quarter of a century ago in the United States Department of Defenses Advanced Research Project Agency (ARPA). It was envisioned as an experiment to explore the possibility of a disaster-proof nationwide computer system, where military personnel could share messages and data no matter where they were or what had happened. It would alleviate the risk of a centralized control station which could be knocked out, thus shutting down communication altogether. In the late 1960s, U.S. government-funded researchers in California working on the experiment explored ways to allow computers to share information. At that time, computers were almost totally unable to electronically communicate, and to move data from one computer to another required physically transporting punch cards or reels of tape. The network soon began to expand, with more and more university sites coming on-line across the country, and the technology of how to establish links spreading. Along with the communication link, researchers had made progress on the component considered seminal to the Defense Department: making the network resistant or impervious to intentional disabling. The upshot was the Internet Protocol (IP), which enabled any number of computer networks to link up and act as one  and eventually gave the Internet its name. The IP meant that the communication network between the computers was not dependent on any single computer to operate  and could not be shut down through destroying one or even several of the computers. Years later, this principle was put to the test in the Gulf War, when Desert Storm forces sought to wipe out the Iraqi computer system  which was linked through the Internet  and were unable to do so. Thus, the Defense Department got what it wanted. And a new, growing system of computer networks was spawned. The Internets growth was slow but steady. Author Jerry Pournelle, who first got an ARPANet account in 1977, recalled the infancy of the Internet. Back then, when a convention featured a party for network users, only a few dozen people would show. In 1978, after a year or so of experience with ARPANet, I predicted that by the year 2000 anyone in the civilized world would be able to get the answer to any question whose answer is known or calculable, said Pournelle. While the Defense Department continued to pay for just about every aspect of the network, in the early 1980s the military network split off from the educational networks and became known as MILNET. The National Science Foundation (NSF) became interested in the Internet, formed its own network on the Internet, NSFNet, and decided to disseminate the Internet Protocol technology to universities nationally. Concurrently, other government agencies, such as the National Aeronautics and Space Administration (NASA) and the Department of Energy, got involved. The Internet soon was crowded with government agencies, and a broad, powerful but chaotic system was born. In time, NSFs network became much more dominant than ARPANet, and the vast majority of new as well as old Internet business was coming to NSFNet. By 1990, ARPANet shut down; but the NSFNet, despite having outlived its original research-oriented purpose, was so entrenched in the Internet that it lived on, maintaining and expanding the Internet. Also, as years passed, the scientific presence and interest was totally drowned by waves of users seeking access for information, communication, entertainment and commercial enterprise under the NSFNet acceptable use policy which afforded wide public access to the network. In 1994, NSFNet wound down, and its traffic is being taken over by commercial networks  Merit Network, IBM and MCI. Today, although far from its original concept, the Internet satisfies far more needs and wants than ever envisioned. It is a true example of technology that can help mankind move into the future.